Create tokens based on the OnlineShopVoucherSeries. Create a Pricing Rule for the OnlineShopVoucherSeries and define the benefit of the voucher. Allow the user to add a token to his cart. A voucher series contains basic information of the voucher and settings for creating the voucher tokens. It is represented by OnlineShopVoucherSeries objects. 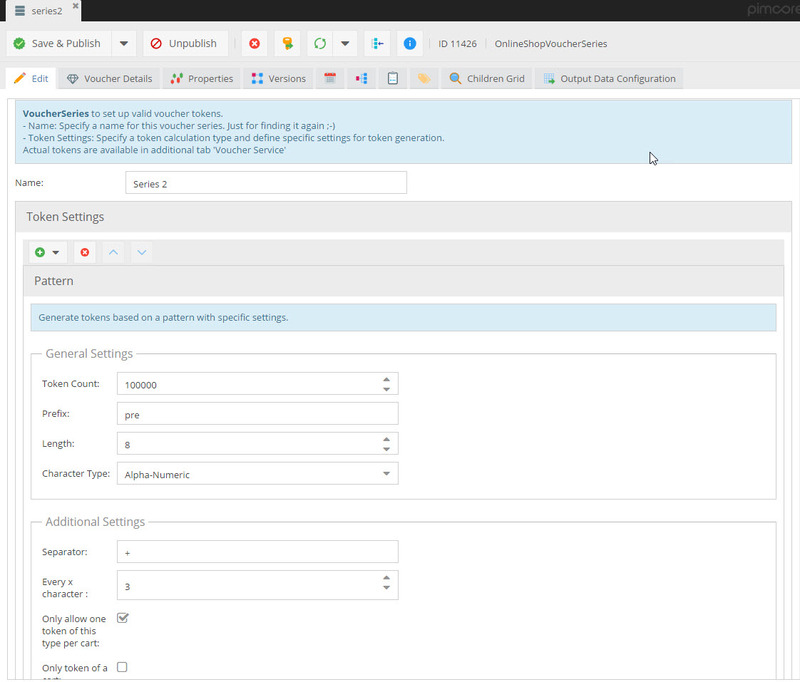 The corresponding class is added to the system during installation of the E-Commerce Framework. Currently there are two types of vouchers supported - Single and Pattern. Single: One single token is defined that can be used multiple times. Pattern: Tokens are generated based on a certain pattern definition. 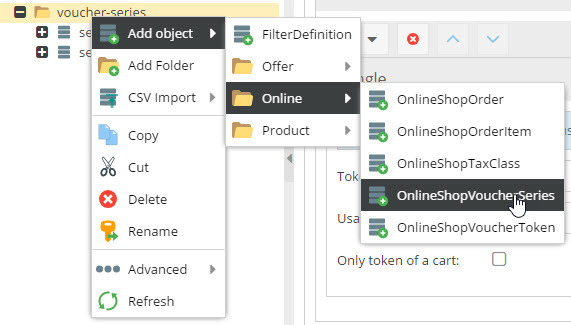 In the Pimcore Backend UI, each OnlineShopVoucherSeries object has an additional tab for managing the voucher tokens. 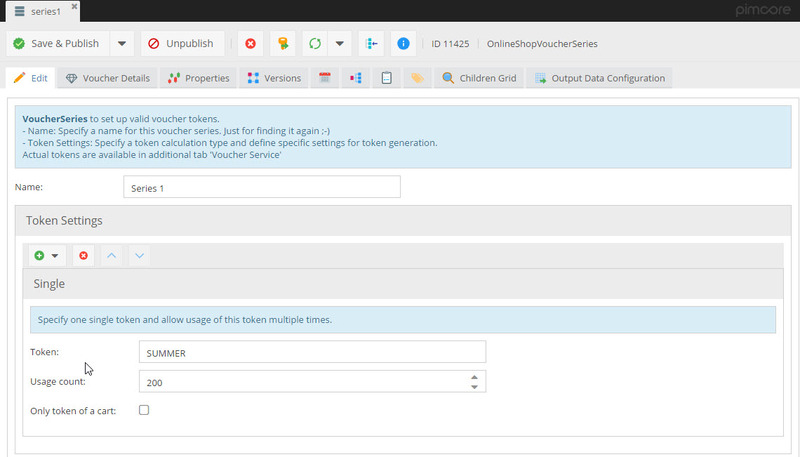 Depending on the token type there are different functions for managing the tokens and some statistics concerning the voucher. Simple: 'Activate' the token and specify how often it may be used. 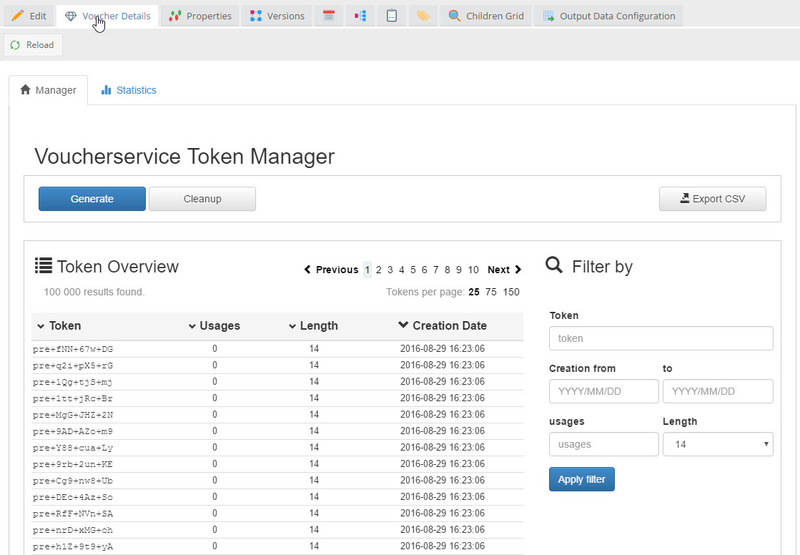 Pattern: Create tokens based on the defined pattern, export created tokens as csv and get an overview of created tokens and their usages. Once a voucher series is defined and tokens are created, a pricing rule has to define the benefits of the voucher. To do so, a special condition allows to specify the voucher series the pricing rule should be valid for. As action all available actions for pricing rules can be used. A voucher token is always applied to a cart. To do so, use following snippet. 1 Token already in use. 3 Token reservation not possible. 4 No token for this code exists. 5 Criteria oncePerCart: Token of same series already in cart. 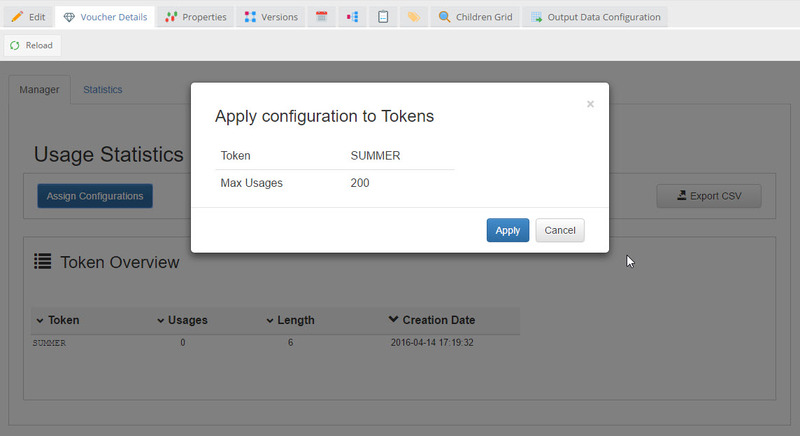 6 Criteria onlyTokenPerCart: Tokens in cart and tried to add token of type "only". 7 Criteria onlyTokenPerCart: Token of type "only" already in cart. 8 No more usages for a single token. Since benefits for vouchers are defined via Pricing Rules, no special actions are needed to display them. They are just displayed the same way as all other Pricing Rules.